Deal Book. Berkshire Hathaway Incorporated’s subsidiary, MidAmerican Energy, bought Nevada’s largest electric utility, NV Energy Incorporated, today for $5.6 billion, or $23.75 per share which is a +20% premium on the current stock price of $19.75 and a +50% premium on the current Risk Price (SF) of $16 (Reuters, May 29, 2013, Buffett picks up Las Vegas-based NV Energy for $5.6 billion). MidAmerican Energy is entirely Iowa-based and about five times the size of NV Energy, and the head offices of the two companies are separated by at least three states whether we go north or south (please see the map), but the deal is expected to help NV Energy retire its coal-fired plants and replace them with renewable energy and gas-fired plants (ibid, Reuters). NV Energy was paying a dividend of $0.19 per share per quarter, or $180 million per year to its shareholders for a current yield of 3.9%. That amount, $180 million, is more than 60% of last year’s income (after tax) which was $322 million, but has been as low as $160 million to $180 million in recent years. Dividends, of course, are no longer an issue, but the interest on $5.6 billion, would be $100 million per year at 2% (if we can get it) and NV Energy also has existing liabilities of $8.3 billion on which it paid $300 million in interest last year. At the Risk Price (SF) of $16, the company is “valued” at $3.7 billion and that’s “as good as cash” and “better than money”, which is the meaning of the price of risk (please see the references below). But we can’t buy it for that price if the investors who are buying and holding the stock at $20 believe that the company is or will be “worth” $20 to them on the same basis – “as good as cash” and “better than money”; and if we’re only offering $20, why should they sell it to us? In practical terms, NV Energy has total assets of $11.8 billion, total liabilities of $8.3 billion, and a shareholders equity of the difference, $3.5 billion. Moreover, at $16, the dividend yield would shoot up by 25% to 4.5% or more, which certainly exceeds the current familiar rate of inflation of about 2% (or less) to perhaps 2.5% in the foreseeable future. And so, $16 is right on the money, and even a bit cheap or “opportunistic” which one might expect if there is a “meeting of the minds” between “risk seeking” and “risk averse” investors. Please see our Post, Bystanders & Collateral Damage, April 2013, for more insight into that observation. But all of that is still true at $24 which is the purchase price of all the earnings in an environment in which “money” as “cash” has a depreciating value. Best to buy something that is “as good as cash” and “better than money”, such as The Wall Street Put before they’re all gone. 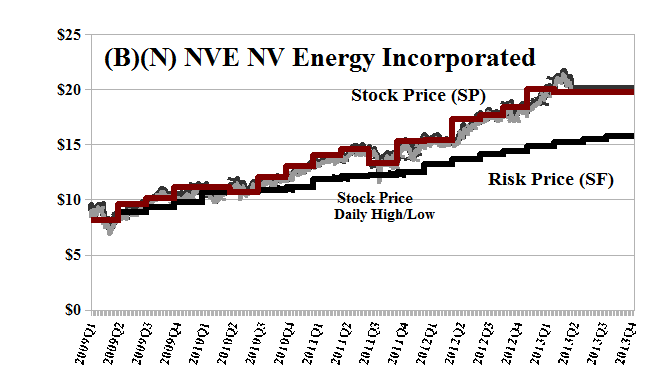 NV Energy Incorporated is an investor-owned holding company. Its utilities operate three business segments: NPC electric, SPPC electric and SPPC natural gas in the state of Nevada. From the Company: NV Energy Incorporated together with its subsidiaries, engages in the generation, transmission, distribution, and sale of electric energy in Nevada. The company generates electricity from its gas, oil, and coal generating units. It also delivers natural gas service. As of December 31, 2012, the company served approximately 850,000 electric customers primarily in Las Vegas, North Las Vegas, Henderson, and adjoining areas; 324,000 electric customers in the western, central, and northeastern Nevada, including the cities of Reno, Sparks, Carson City, and Elko; and approximately 153,000 customers with natural gas service in Reno/Sparks area of Nevada. It has a generation capacity of approximately 6,078 megawatts through 61 generating units. NV Energy, Inc. serves residential, commercial, and industrial customers, as well as gaming/recreation, mining, warehousing/manufacturing, and governmental entities. The company was formerly known as Sierra Pacific Resources. NV Energy, Inc. was founded in 1906, has 2,700 employees, and is headquartered in Las Vegas, Nevada.